To me “swank” has a specific meaning. It means big, for a start. Wild but also professional. Swank means having your act together and your fundamentals down, taking a running start at the next horizon, playfully scaling up, raising stakes and expectations for dramatic effect, knowing with grinning certainty the exact moment you’ll blow the minds of your audience and your rivals. To dress impeccably, then dance. Swank is the result of a big risk that pays off. The gold standard of architectural swank was Morris Lapidus, even accounting for the way today’s “explanations” (of his “stairway to nowhere” at the Fontainebleau for instance and a dozen other specifically engineered surprises) ruin his showmanship, interrupt his setups, explain the jokes. Among all valley resorts, two of them had this quality of being a big risk that paid off. Mountain Shadows was one of them. If you want to talk professionalism, start with this particularly sweet location across from the venerable Camelback Inn. Add in the valley’s canniest and richest developer and his house architect (we’ll get to that). You have to have a golf course. And service levels? Well, anybody who remembers their dog-eared soft-cover copies of the Mobile Travel Guide on the passenger seat will be impressed with the Mountain Shadows’ five-stars. Fifteen properties in the whole U.S. got five stars. In those days worth driving across a couple of states to see one. Mountain Shadows accomplished that for years on end. A lobby as if Mary Colter designed a regional airport for the Flintstones. Stroll through that lobby with its scaled-up flagstone walls, massive walls fit for a desert stronghold, and you were automatically pulled as if on a cable on your belt buckle towards the southern windows and the sunny pool. Without a doubt, that pool was the focus. Twice Olympic size. With its own island of palms. Out by the pool you gradually became aware that the guest rooms were…curved. Structural curves are expensive y’know. The guest rooms were on one big circle around the pool, in fact, all facing the pool, with sporty angled privacy partitions between, and sort of backed into a surrounding berm to preserve the pool views for the rest of the property. This is all the setup. One big perfect circle. Midway through the second drink at the pool bar, you might realize you’re in a roulette wheel. That’s the joke. After the third drink, if everything starts spinning, you know why. 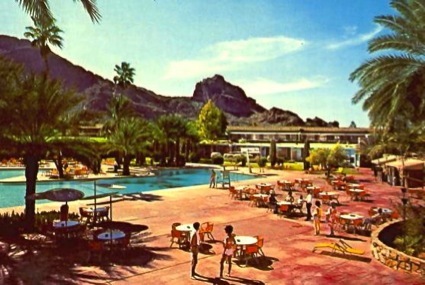 The books say developer Jim Paul opened the Mountain Shadows on January 15, 1959, and sold off chunks of the resort to Del Webb in 1961 and 1963. My informed guess is that Del Webb was involved from the beginning, because Del Webb was always wily like that with the tax man, and because the architect here was Martin Stern Jr. Stern deserves more attention. He’d designed three southern California “Ships” coffee shops in 1957 and 1958, which makes him a foundational “Googie” architect if you like to use that word, and worked steadily with Del Webb from 1954 at the Sahara in Vegas. Most of his biggest and best work was in Vegas. Hence the roulette wheel. Maybe. The Webb house newspaper always called him “Martin Stern Jr. of Beverly Hills”. Stern had plenty of flair and occasionally, with Del Webb’s funding, rose to this level of swank. For the Ships coffee shop in Westwood he’d topped the structure with a cantilevered steel butterfly truss, for no other reason than to catch the eye. Among east-coast purists a structurally unnecessary truss was a big no-no, which is why they came up with that backhanded “Googie” category. That name was meant as an insult. But catching the eye was the entire point. Stern designed a lot of hotels and resorts in California and Reno and Vegas for Del Webb over two decades or so. My personal favorite is the 1964 tower at the Sands. It was the first high-rise in Vegas, the first sign that a taller and denser and more urbane Strip was on the way, so it was a historical turning point like that. More importantly it was an amazing one-of-a-kind piece of curved modernist exoticism in concrete, faintly Islamic, those hoods around its crest evocative of “the desert” in a way that’s hard to pin down, and 100% swank. So once Mountain Shadows was among the best resorts in the southwest. Lots of style decisions from another time. Lots of good memories for locals, like Scott, who reminded me that they were friendly and gave out pool passes. They were the first large resort to stay open year-round and probably wanted to build traffic in the summertime. But, you know, for the owners, for the John C. Lincolns and the Del Webbs of the world, the resort was always the side dish, and if you can squeeze out 8% margin, great, fine, but the resort mainly functioned to raise the price of the surrounding real estate. Once the surrounding land was built out and sold off, you have to move on. In 1981 Del Webb sold it to Marriott. Into the early 2000’s it was used as an overflow property when the Camelback Inn across the street overbooked. Then that no longer worked out financially. It’s been years coming, this long goodbye to Mountain Shadows. If swank has any place in the afterlife, I’ll see you on the other side.